We offer best quality branded products like Ilmadur, Klinger, Flat borosilicate gauge glasses-Standard (Reflex & Transparent) and Hi-Pressure Transparent. Gauge glasses are mostly used in liquid level gauges. Aluminosilicate glass is composed of a mixture of alkali silicate glass formulation and aluminum oxide. This makes the glass more resistant to higher temperatures without altering or changing its form. Aluminosilicate glasses are preferred for applications that have high temperature and pressure. 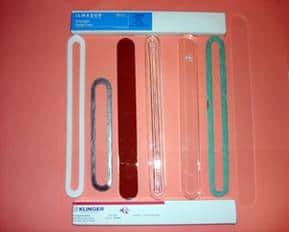 Aluminosilicate gauge glass comes in Reflex and Transparent type. B&M Mica can provide 5 &12 series narrow glasses in two different qualities like toughened soda lime and cut from borosilicate plates. These glasses have proper chamfered edges and the Reflex glasses have machine cut grooves. 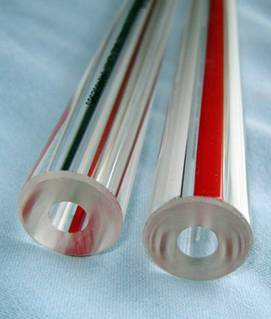 B&M Mica stocks Hi-Pressure Tubular Gauge glass, Heavy Duty tubular gauge glass, red line tubular gauge glass, Standard tubular gauge glass, Heavy Wall Red Line tubular gauge glass, the edges of which are fire polished. B & M can also provide special sizes as per customer specifications by cutting it from a longer length glass, in which the edges of the glass tube will finely grin. B &M Mica keeps a large inventory of all these sizes and types to be shipped on time. Shields (Mica, KEL-F & LEXAN SHIELDS). 5/12 series Narrow glasses for low-pressure boilers. Nuclear Plants, Power Plants, Oil Refineries, Paper industries, Textile Industries, Chemical & Petro Chemical plants. Mica shields are used to protect the liquid level gauges from acidic and corrosive solutions. The two most common mica shields used are of V-2, V-4 & Commercial quality. The thickness of these shields is 4-6 mils, 6-9 mils & 9-12 mils. We stock all qualities Mica Shields from size 1 to size 9, width 1-5/16. Also up to 20 inches Long X 1 inch Wide with Round Edges. Mica shields can be replaced by Kel-F. It protects the glass surface from highly corrosive chemicals. We stock Kel-F shields from Size 1 to size 9. The thickness of Kel-F shields is 1/16”. Mica shields can be replaced by Lexan Shields. The thickness of Lexan shields is 0.030”, 0.040″ and 0.060″ (Approx). Can be made as per customer specification in any shape (circular, rectangle or Square). Used in LENS for sight glass windows, sight flow indicators, Bull’s eye see-through Flange. We also make Circular-round Mica, KEL-F & LEXAN discs for protection of sight glasses, sizes in Diameter: 10mm, 15mm, 24mm, 25mm, 30mm, 31mm, 34 mm, 38mm, 40mm, 44mm, 45mm, 50mm, 51mm, 52mm, 56mm, 60mm, 70mm, 80mm, 90mm, 100mm, 110mm, 120mm, 125mm, 150mm, 180mm, 200mm, 250mm, and other sizes. Thickness: 0.20+/- 0.03mm, 0.10 +/- 0.030mm and other sizes in mica. Thickness: 1/16” thick in KEL-F.
Non-asbestos gaskets are most commonly used in low-temperature boilers or in mild acids. Graft oils are superior to non-asbestos gaskets and have two types- Grafoil GHR and Grafoil GHP. Grafoil GHR have stainless steel insert while Grafoil GHP has mylar insert. B&M stocks all the above gaskets from Size 1 to Size 9. The thickness of each of these gaskets is 1/16”. "B & M Wants Your Toughest Job"
B & M Mica Co has been providing high-quality mica products to various industries all over the world since 1975. B & M Mica Co has been World Leader in Designing and Manufacturing of high precision mica component. The industries we serve include laser, nuclear, medical, electrical, electronic, scientific research, arts, and others. Our mica products are the highest quality and we meet all client specifications. Our service and delivery time is unmatched in the mica industry. B & M Mica Co. Inc.